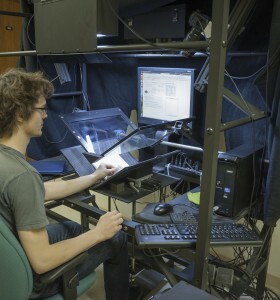 We use a variety of scanning equipment to capture high quality digital images without harming the original materials. 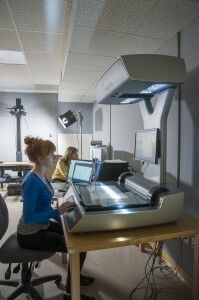 The scanners and cameras are managed by the UNC-Chapel Hill’s Wilson Special Collection Library’s Digital Production Center. For more information on the digitization specifications we use, please visit Digitization Guidelines. Epson 10000XL flatbed scanners with transparency adapters allow for the digitization of flat reflective and transparency materials. 2400 pixel per inch optical resolution can produce 24- or 48-bit RGB files or Grayscale files. Used primarily for photographic print originals where high-resolution, high-quality image captures are required. Also used extensively for digitizing sheet film originals, such as 4×5, 5×7, and 8×10 sheet negatives as well as glass plate negatives. The Epson 10000XL works with the Silverfast Software. 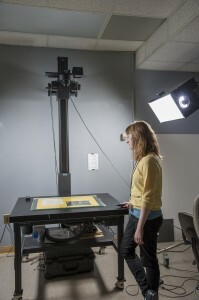 This equipment was purchased for the North Carolina Digital Heritage Center using funds from the Institute of Museum and Library Services under the provisions of the federal Library Services and Technology Act as administered by the State Library of North Carolina, a division of the Department of Cultural Resources. The Flextight X5 scanner by Hasselblad is used to scan slides. 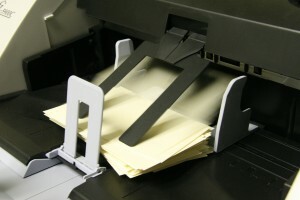 The scanner allows for up to 50 slides to be scanned in a single session with little supervision needed. In addition to standard 35mm slides, the Flextight can handle various sizes of negatives as well. The Flextight scanner works with the FlexColor software. High-volume production scanner provides fast (120 pages per minute, simplex ~ 240 images per minute, duplex), high-resolution image capture from uniform sized unbound materials. Can digitize original material from business card size up to 11×17. The Fujitsu utilizes the ScandAllPro software and has multiple output format options for both color and black & white images. Provides high-speed, high-quality mass digitization techniques for bound materials. 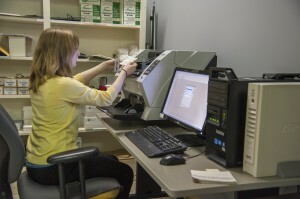 The scanners can produce approximately 3,000 digitized pages of original text per day. Digitized materials are hosted on the Internet Archive Web site and are fully available for download in multiple formats. 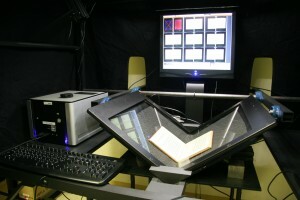 High-speed/high-resolution overhead scanning system, designed specifically to allow for digital capture of books, manuscripts, and fragile documents with minimal handling and fast image capture times. Completes a 300 pixel per inch 24-bit RGB capture in approximately 5 seconds. Allows for multiple file format image delivery and utilizes the Omniscan software. The Hasselblad H6D-100c with a 120 lens is used to shoot large format materials such as maps, drawings, and posters. The camera is 100 megapixels, allowing incredible levels of details even on very large maps and drawings and uses Hasselblad’s Phocus software. 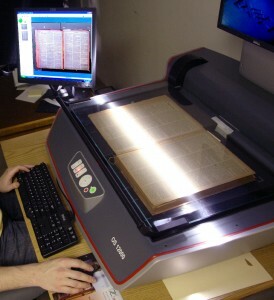 Many over-sized, flat items are held in place during digitization with a 48″x60″ Teaneck upright vacuum table. The PhaseOne 645DF+ camera system is composed of the 645DF+ camera, which works with a lense and a digital back to capture high quality images of materials that are too large or fragile for a flatbed scanner, such as newspapers, scrapbooks, and framed items. It utilizes the Capture One software. The Nikon D700 is a full-frame digital single-lens reflex (DSLR) camera and uses a 12.1 megapixel FX-format CMOS sensor. Adobe Bridge and Photoshop are the software products used with the camera. The Nikon D700 is used to photograph objects such as clothing, stuffed animals and other 3D objects that are included in Digital NC. 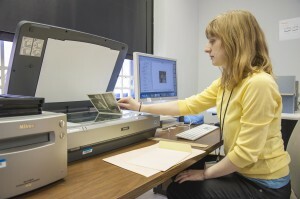 Some of the equipment featured on this page was purchased using funds from the Institute of Museum and Library Services under the provisions of the federal Library Services and Technology Act as administered by the State Library of North Carolina, a division of the Department of Natural and Cultural Resources.